In Amitav Ghosh's Sea of Poppies, the Ibis began its treacherous journey across the Indian Ocean, bound for the cane fields of Mauritius with a cargo of indentured servants. Now, in River of Smoke, the former slave ship flounders in the Bay of Bengal, caught in the midst of a deadly cyclone. The storm also threatens the clipper ship Anahita, groaning with the largest consignment of opium ever to leave India for Canton. Meanwhile, the Redruth, a nursery ship, carries horticulturists determined to track down the priceless botanical treasures of China. All will converge in Canton's Fanqui-town, or Foreign Enclave, a powder keg awaiting a spark to ignite the Opium Wars. 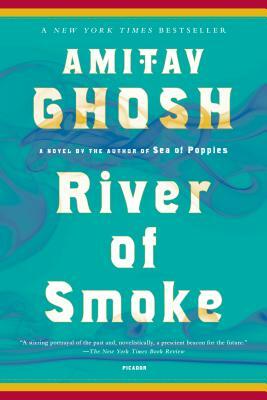 A spectacular adventure, but also a bold indictment of global avarice, River of Smoke is a consuming historical novel with powerful contemporary resonance. Amitav Ghosh is the internationally bestselling author of many works of fiction and nonfiction, including The Glass Palace, and is the recipient of numerous awards and prizes. Ghosh divides his time between Kolkata and Goa, India, and Brooklyn, New York.